I have made no secret of my love of stripes, the French-Navy-striped “la marinière,” in particular and French label Petit Bateau is one of the masters of the iconic striped tee. 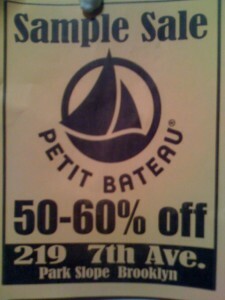 Even better when Petit Bateau has a massive sample sale and it’s just a brisk walk away from home. I was late to the game on this sale – it began in early December – but it is in full swing still until the end of January and there was plenty of stock at last check. I scored a classic, long-sleeved stripey top pour moi and about five adorable shirts for the kids. Everything was at least half price, often even more; think $15 for a red + white striped boys’ cotton tee. Like any sample sale, you have to dig through boxes and there isn’t a fitting room. The chap running the show is incredibly accommodating though and let me slip things on over my clothes. For the record, if you happen to be petite and small chested in particular, don’t worry that there aren’t many tops in women’s small – try the 12, a sort of teen/junior sizing – and it will likely work just fine. There are pants, tunics and a smattering of skirts and underwear too, but the real boon is in the tops. 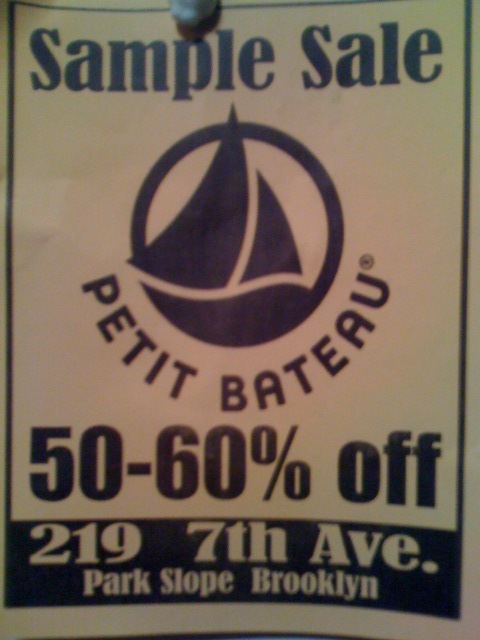 The sale is at 219 Seventh Avenue, between Third + Fourth Streets. Cash and credit cards are accepted.